After pulling my calf, I’ve been biking even more than usual. Since it hurts to walk more than a block, I’ve been biking everywhere, door to door if I can, aiming to never let my feet touch the ground. I was coming back from a happy hour for the Climate Ride. Cyclists did 208 miles over three days to raise money for climate change research. Once in Washington, they were greeted by Senator Sheldon Whitehouse, who insisted that climate change was a bipartisan issue and that there were Republicans who would be on their side, were it not for the pernicious influence of anonymously-funded PACs. It was a sweaty day, unusual for the end of September, with temperatures in the 80s. The news has been filled with hurricanes, first Florida and then Puerto Rico, while Trump has tweeted slurs against NFL athletes. After happy hour, I rode home as it got dark. Just off the National Mall, traffic was stopped. Filtering up to the top of the queue, I saw why – a long stream of people in wheelchairs were rolling through the intersection. They were returning home to their hotel after demonstrating against the repeal of Obamacare. Imagine the level of commitment – and desperation – required to travel anywhere in a wheelchair, much less a strange city, to spend the day demonstrating against a government that wants to kill you. 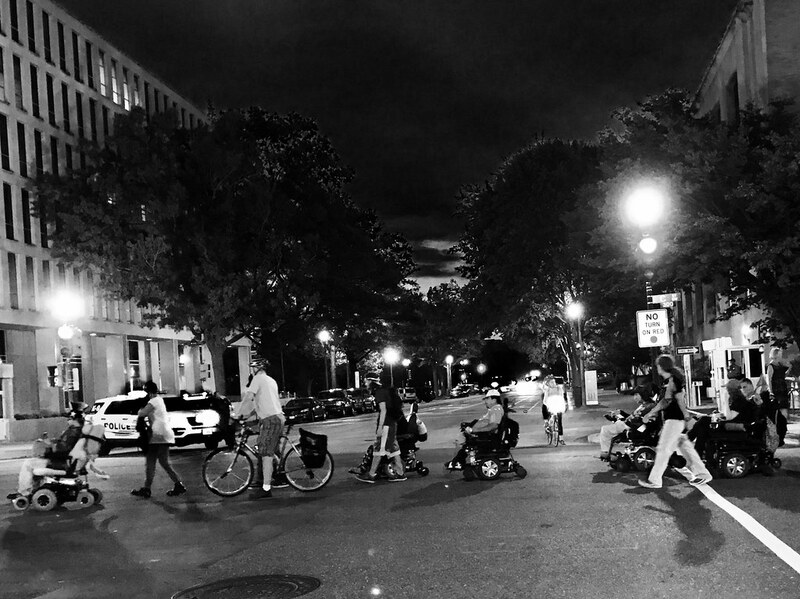 The Metropolitan Police Department had blocked traffic so that these wheelchair-bound protesters could get home. Three cars were devoted to this purpose. The MPD has mastered this kind of rolling roadblock, gaining experience escorting the numerous anti-Trump demonstrations that have rocked the city. A long silent moment passed as drivers, cyclists and pedestrians waited respectfully as the people in wheelchairs crossed the intersection. The protesters who came to Washington, the police protecting them, the people who waited – we represent the best of the country, while our leadership represents the worst.